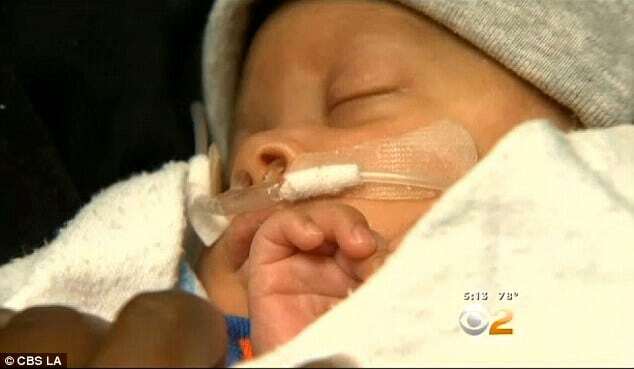 Baby boy Silas Philips has been hailed a medical miracle after miraculously being born still inside his amniotic sac. 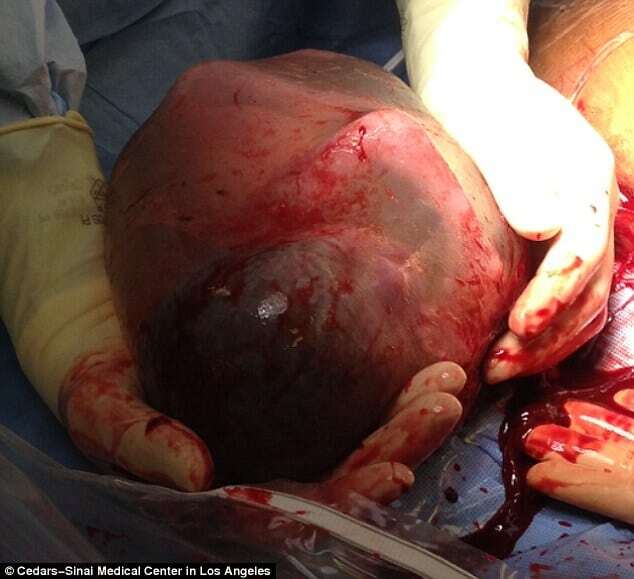 Delivered three months prematurely via caesarean section at Cedars Sinai Medical center in California, attending doctors were shocked to see the baby boy’s amniotic sac still intact. Pictures taken at the child’s birth show the infant curled up inside with the placenta and umbilical cord, his tiny hands and a leg clearly visible. Remarkably until the bag was broken, baby Silas was still getting his oxygen through the placenta. In describing the unnatural birth, medical textbooks describe the amniotic sac as a bag of clear, pale fluid inside the womb where the unborn baby develops and grows. The fluid helps to cushion the baby from bumps and injury, as well as providing it with fluids it can breathe and swallow. It also maintains a constant temperature for the baby. Typically the amniotic sac breaks on its own during birth, which is commonly referred to as a mother’s ‘water breaking’. That or during a C-section, the surgeon cuts through it to deliver the baby. 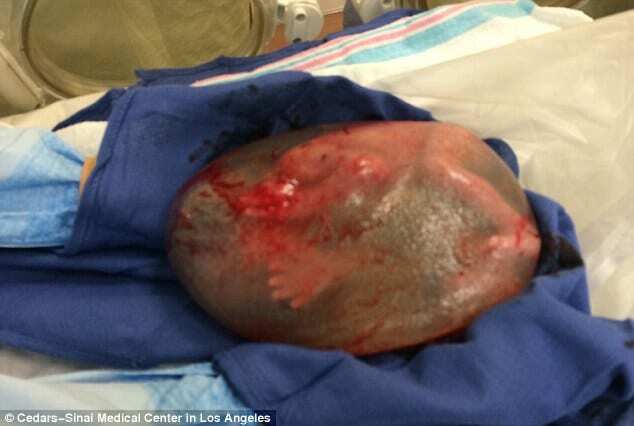 Doctors say the chance of the amniotic sac remaining completely intact after birth is ‘ultra rare’. It was a moment that mesmerized Dr William Binder, who delivered Silas. ‘Even though it sounds cliched, we caught our breath,‘ he said. ‘It really felt like a moment of awe… and one that will stick in my moment for some time. After taking a few seconds to photo the sight in front of him, Dr Binder set to work removing Silas out of his amniotic sac and getting him breathing. 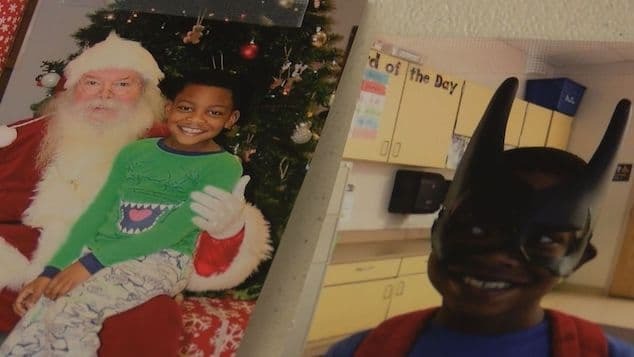 It wouldn’t be until after Dr Binder passed on a photo of the newly born Silas Philips to the child’s mother that Chelsea Phillips came to terms with her first born’s extraordinary birth. ‘He was kind of in a foetal position and you could see like his arms and his legs curled up. Despite being born at just 26 weeks, Silas is doing so well that doctors hope he will go home within the next month.